Bellbrook sophomore guard Brooklyn Hall (33) puts up a shot in the first half of Friday’s March 2 Division II girls high school basketball district title game against Cincinnati Roger Bacon in Mason. Hall led all scorers with 20 points in the Golden Eagles win. With the Bellbrook student section yelling their support, Golden Eagles senior Cassidy Hofacker (21) makes her way up court in the first half of a girls high school basketball Division II district championship game against Cincinnati Roger Bacon. Bellbrook won the school’s seventh district title with a 65-42 win in Mason. Roger Bacon’s Kelly Brenner (right) cuts off the lane of Bellbrook senior Bekah Vine, in Friday’s March 2 district championship game at Mason Arena. Bellbrook won in convincing fashion, 65-42. 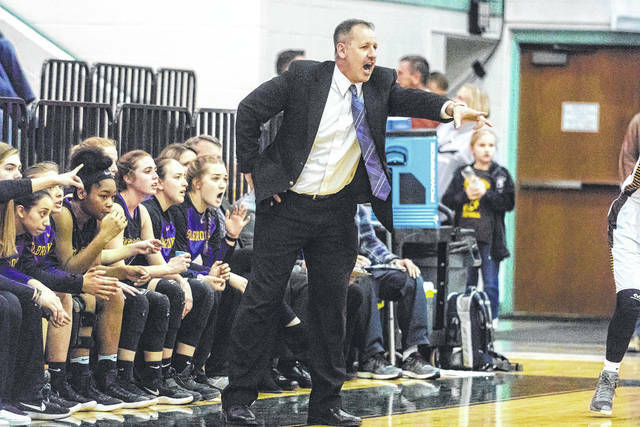 Bellbrook coach Jason Tincher yells instructions to the Golden Eagle defense during the first half of a 65-42 Division II district title win over Roger Bacon, March 2 at Mason Arena. MASON — The Bellbrook Golden Eagles girls high school basketball team may have served notice to the rest of Ohio on Friday night in Mason Arena. They’re a pretty good team, and they may just now be hitting their stride. 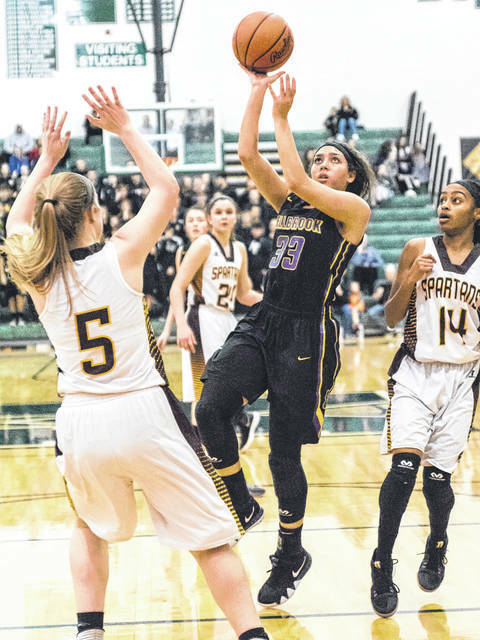 Bellbrook (18-8) used a feisty zone defense, solid rebounding and precision shooting to thump Cincinnati Roger Bacon, 65-42, to claim the school’s seventh district title. The veteran Golden Eagles squad slowly extended its lead throughout the first half, leading 17-8 after the first quarter, and doubling up the Spartans (17-8) by a 30-15 count at halftime. Bellbrook then extended that lead to 51-25 after three quarters of play. 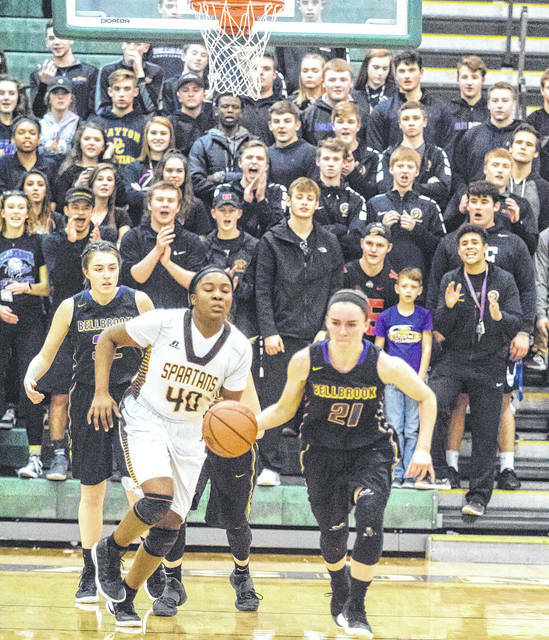 A young and up-and-coming Roger Bacon bunch outscored Bellbrook by a 17-14 clip in the final period, but the Golden Eagles’ lead was never seriously threatened. Bellbrook coach Jason Tincher said he’s seen his Golden Eagles improving for awhile now. Sophomore guard Brooklynn Hall led all scorers with 20 points, and seniors Cassidy Hofacker and Bekah Vine knocked in 13 points each. 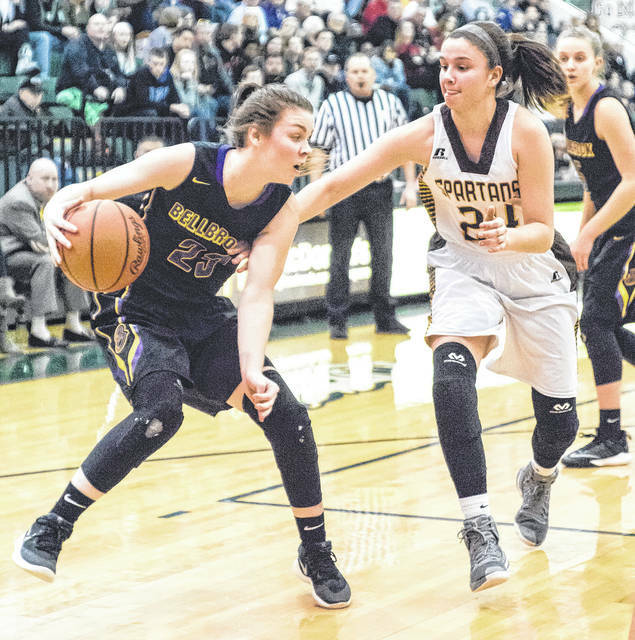 Olivia Greathouse and Kayla Paul combined for 14 points, and junior backups Maren Freudenschuss and Maria Mescher added five fourth-quarter points for Bellbrook. Roger Bacon had been on a five-game winning streak, including tournament wins over Cincinnati Taft and Cincinnati Northwest. Out of the always-tough Greater Catholic League Co-Ed, the Spartans have a bright future as they only lose two non-starting seniors from this year’s team. Freshman Kylee Sheppard led the Spartans with 13 points scored, and sophomore Kelly Brenner finished with a dozen points in the loss. Bellbrook will now face either Carroll or Franklin in the regional semifinals. That game is scheduled for March 6 at 6:15 p.m. at Springfield High School. At halftime, Carroll held a 20-16 lead over the Wildcats. Golden Eagle seniors Vine and Hofacker say they can feel the cohesiveness that coach Tincher had been talking about. This season’s Golden Eagle squad is a very close-knit unit. Vine said it helps the starters to know that there will be no letup whenever someone comes off the bench. Friday’s district title is the seventh such trophy in Bellbrook school history. Bellbrook lost in the district title match a year ago.